It is night and in the cemetery grave robbers strike. Soon, a mountain of gold bullion is shipped out of the United Kingdom and Gene Bradley is on a movie set on the other side of the world. Mr Parminter and his team will have to take on this case without Gene’s help. The trail of dead gold takes Parminter across western Europe to ultimately face off with the leaders in the illegal gold trade. Gold bars, probably one of the worst things to steal off anyone however when there are hundreds of them, it would be a difficult choice. Gene Bradley is on location shooting a movie when the inevitable gold bullion goes missing ploy. 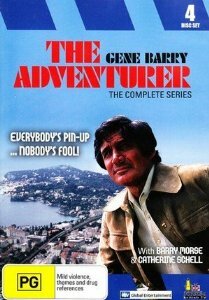 The lack of screen time for Gene Barry shows the behind the scenes tension between Gene and pretty much everyone else. The lack of screen time also means that Barry Morse, Catherine Schell and Garrick Hagon team up to retrieve the gold and a greater part of the storyline. The Outlaws steal a shipment of gold in Sherwood Forest. This haul will be great for the Outlaws and the local villagers, however Rolf, one of the Outlaws, holds back a plate of gold for his own mother as she is saving to leave the shire. During their meeting to exchange the plate, bystanders see a glimpse of the figure that gives this gold to the villager. This glimpse gave the impression that the gold was handed over by none other than the devil himself or at least a demon. The Sheriff caught wind of this witch story and the stolen gold so he excited the villagers into a frenzy over this evilness. Robin, Rolf and the rest of the Outlaws must now try to calm down these rumors by playing the same game before the witch is burned at the stake. A great episode in this first season. The temptation of an outlaw to help his own mother must have great. When he does, he unintentionally causes trouble within his mothers village and within the outlaws. Robin and his crew will need to stop the hyped up villagers from killing an innocent woman whom simply wanted to save herself and her son. This touching story proves to be one of the better written stories of this season.